Looks like it’s time for TRWP Connect to wrap up Make Cycle 4 and wrap up another year skidding through the intersections between poetry and science. That doesn’t mean it’s time to lock up your microscopes and pencils; it just means it’s time for you to level up in your own time, in your own way. So good luck with that. On April 25, Mozilla’s Chad Sansing talked with us about the value of learning to write computer code and the steps Make the Web is taking to help people empower themselves in digital spaces. But before we were ready to dig into html, we thought about codes as tools for encryption. Jennifer Smyth’s students populated a digital landscape with their names coded in binary with Legos, while Taylor Lucas hosted a bead coding hack jam and Suzanne Moses challenged our decoding skills with a wingdings-encrypted message. We also toyed with the idea of poetry as code. Josephus Thompson from The Writing Project treated us to a video about hacking haikus. Rob Puckett’s students hacked sites with Thimble to create their own Earth Day poems, as Ashley Hutchinson’s students captured themes from Miss Peregrine’s Home for Peculiar Children in six-word poems. All of this–all of these intersections between poetry and science–beg us to keep moving, keep making. They ask us to be careful observers of the microscopic and the macroscopic worlds we live in. They ask us to study. To dig deeper. To know more. And to keep making meaning we can share with others. Keep on posting your ideas, comments and makes in the G+ Community, and apply for the badges below to recognize the learning and making you did this academic year. Go to Credly, create a free account, and use the indiclaim codes to apply. Upload a picture, a video, a file, or a link to something you made during each make cycle to earn them all! We hope to see you again next year! In the meantime, contact Stephanie West-Puckett with questions, comments, or ideas of how you, too, can get involved! Welcome to the final make cycle of 2015-16 Remix, Remake, Curate! At the beginning of the month, we explored DNA’s amazing way of coding the lives of every living thing. We will spend the remaining two weeks in April examining the idea of coded language in poetry and technology. Think about the power of coding as a method of communicating a message. Bees encode messages about the location of fresh pollen in an articulate aerial dance, as early Homosapians once encoded stories of a successful hunt in glyphs on cave walls. The Navajo code talkers encrypted messages that aided American Marines’ success during WWII, just as today’s computer codes are powerful enough to give life to the World Wide Web. The ability to write these codes and decipher them is, indeed, empowering. For this make cycle, you will begin with solving a code before progressing to creating your own low-tech/no-tech code, encoding a message in poetry, and hacking computer code with your poetic message. 23-5-12-3-15-13-5 20-15 2-18-5-1-11-9-14-7 20-8-5 3-15-4-5! 20-8-9-19 9-19 7-15-9-14-7 20-15 2-5 1-14 5-24-3-9-20-9-14-7 23-5-5-11! For this low barrier/no tech make, we invite you to create an object that acts as a coded introduction to you. You could code your name or a word describing yourself with beads or Legos. Don’t have any Legos? Try virtual Legos with Build With Me. You could even create an old-school cipher or use binary code to code the letter of your first name. Or, you could use beads to code your name, or a word that is important to you. If you would like to work with a friend, consider trying the “My Robotic Friend” activity. You could code your message into the stacked cups and then “solve” each other’s code. Just be sure to provide a “key” so that we are able to decode your message! Poetry is another way of coding meaning. Part of what makes poetry poetry is the way it takes an idea or thought or experience and presents it in images and metaphors. The images and metaphors are what we read, but when we look more closely, those ideas come together. For this make, we’re going to ask you to create your message to the world. What message do you wish everyone around you could hear you scream out loud? What thought do you wish you could plant in people’s minds? We’re going to write just a single line of poetry to convey that message. Then you can share that message with the world when you remix your poem in HTML for our challenge make. Check out the video below. Back in Make 2 you wrote your message to the world in poetic code. Now it’s time to publish it on the web by coding it in html. To encode an idea in poetry relies on the selection and order of words and symbols and images that communicate emotion and thought. Coding in a computer language, such as html, isn’t much different. HTML, or hypertext markup language, uses a specific set of terms in a specific order to communicate a message. That html code becomes all the colors and fonts and images and information on a web page. If you want more details, Mozilla explains in greater detail how it all works. This make will take place after our hangout with Chad Sansing, so if you feel like you want extra support, be sure to join or view the hangout. 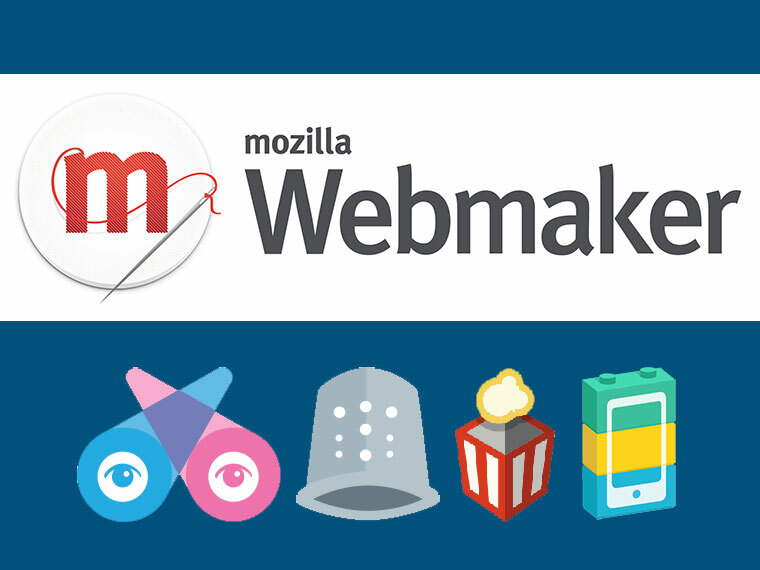 For this make, we challenge you to publish your message to the world on the web using Mozilla Thimble. Watch the introductory video below; then open our message to the world, click Remix, and get started. Play with it. Take risks. Have fun. Also, check out some of the resources below to add background patterns, or change colors and fonts. And don’t forget to share your work on Google+. Or try hacking your poetic message into a news article using Mozilla’s X-Ray Goggles. It’s a relatively simple tool, but it introduces html in a creative way. This tutorial should help you get started. What are your ideas for Leveling Up with codes and computer coding? Using Thimble? Use the links below to find pattern, color, and font codes you can plug into the CSS. These are some of the handy links and places we’ve been using to share and connect. On Twitter, we encourage you to follow and use the #imakesci. Join us for a Twitter Chat Thursday, April 21 from 7:00-8:00 pm EST by following the hashtag #imakesci to talk about codes and coding. Hear it from an expert! Join us on Tuesday, April 25 at 11:30 am EST as we host a Google Hangout with Mozilla’s Chad Sansing, who will answer our questions about the World Wide Web, coding, and the value of making the web. Send us an email (flinchm@pitt.k12.nc.us) if you want to participate, or look for the link in our G+ community to observe. New to all this tech? Check out Getting Started with Google Hangouts in the Guide to Social Tools section of the TRWPConnect blog. Now that you’ve thought about who you are both in body and your digital presence, what is your digital footprint? What are you leaving “out there” in cyberspace? Is this presence something you are proud of? Is it something you want other people to see today? In five years? What would your grandmother or future employers think of the web version of you? What power do you have to make and remake your digital footprint? We’re excited to see posts continue to come in on Google+, but it’s time to wrap up this make cycle as we prepare for the next. We started this make cycle by extracting DNA from strawberries, and we were treated to a time-lapse video of Mike and Elliott Flinchbaugh’s home DNA extraction, as well as photos of the process from Mrs. Pagona’s students, strawberry DNA sculptures from Rob Puckett’s students, and even some images of the DNA we extracted under a cell phone microscope. Visit Remix, Remake, Curate on Google+ to see more. We wrote poetry, individually and collaboratively, during our Twitter chat, in making DNA poem sculptures, and by extracting poems from articles about DNA. Learning about DNA was a big part of this make cycle – we learned about the microscopes capable of seeing DNA, DNA media storage, dinosaur DNA at NCSU, our own Neanderthal DNA, cloned pigs, genetic modification, designer babies, and much more. And, towards the end of this make cycle, we started exploring the ethical implications of working with DNA by imagining gene-spliced animals (is it a kion or a langaroo?) and crowdsourcing topics for articles on ethical issues in DNA. Rob Puckett’s Strawberry DNA meme. Join our Google+ Community, Remix, Remake, Curate. Post your thoughts, questions, ideas, and especially your young people’s work here. On Twitter, we encourage you to follow and use the #imakesci hashtag. Keep using #imicro if you’re continuing to explore DNA. We also sometimes post pictures to Instagram under #imakesci or the tags for each make cycle. If you have a blog, you can make and create in your own digital space and share to the community on Twitter with the #imakesci hashtag or the G+ community Remix, Remake, Curate. Read our Remix, Remake, Curate About page. Learn more about the Tar River Writing Project, the NC Museum of Natural Sciences, and The Poetry Project. Explore the National Writing Project’s Digital Is site for ways to connect digital media with writing and learning. Reach out to us with questions or suggestions in the G+ Community. Feel free to keep extracting DNA, sharing poems, posting pictures, and slicing genes in our G+ community at any time! Feel free to jump in on this cycle if you are new or just keep going with it. Be on the lookout for the next make cycle, on HTML coding and web making, which starts this evening. Thanks for participating – your contributions are inspiring, and it’s been exciting to know that we’re exploring a really complex scientific concept, like DNA, with participants from elementary school all the way to college and beyond. Welcome to Week 3 of our second year of Remix, Remake, Curate! For the next two weeks, we will explore DNA. We will focus on DNA coding, which allows for the massive storage of information on a cellular level. It can be surprising to discover how much data, or information, is stored in our own bodies. You will get a chance to extract DNA , a technique used by scientists who work with DNA regularly (such as crime lab technicians). As with the last make cycle in this MOOC, you are welcome to join in where you can, tackle the makes that appeal to you, get out of your comfort zone and try something new, or show off skills you already have. During this make cycle, we suggest the following activities to guide an investigation of DNA. The Cold Spring Harbor Laboratory’s DNA Learning Center includes a site dedicated to information about genetic disorders, and a series of tutorials and games about the structure of DNA. In the video below, Deb Bailey and Christy Flint, of the NC Museum of Natural Science’s Micro World Investigation Lab, walk us through the process of extracting DNA from strawberries. You can extract DNA from all kinds of living things – wheat, strawberries, and bananas are among the easiest. If you’d like a written walk-through of the process, that’s available here. Show us what the DNA you extracted looks like by sharing a picture of your results through a tweet or post on our Google+ community. If you would like to try a more challenging extraction, follow the directions in this YouTube video produced by NOVA to a very, very small amount of your own DNA by using a scraping from the inside of your cheek. Don’t forget to share your results or some more ideas by posting them on our Google+ community. To learn more about the DNA molecule, check out this DNA Factsheet from the National Institute of Health’s National Human Genome Research Institute. The process of extracting DNA from strawberries is much like the process of pulling a found poem from longer text. Check out these found, or extracted, poems on Pinterest – some of them are creating interesting images (as well as using interesting imagery). How do you think the authors of these poems are deciding what words to keep? How do the words they choose express a theme or central idea? What strategies can we borrow from the authors of these poems? In what ways do the images drawn on the page reflect the central idea of the poem? What images might we use to reflect our ideas about DNA? We invite you to create your own found poems using articles about DNA coding (for articles, check out the Resources section below). You can print paper copies of the articles to work with, or you can use digital tools to make a found poem by taking screenshots of the articles and using a drawing or image application, like MS Paint, GIMP, Pixlr, PicMonkey, Finger Draw, or You Doodle to isolate text and create an overlaying image. We’re pretty sure you know of some tools that we’re not aware of yet, and can’t wait to see what you use to make your found poems. If you find a new tool, make sure you share it in our Google + community. 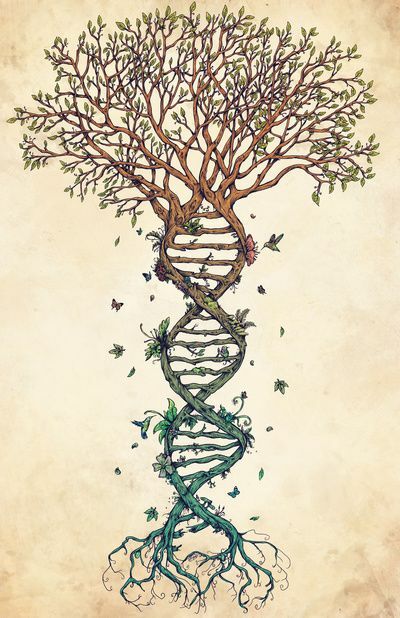 Your DNA houses the information that made you, that shaped your development and continues to shape your interactions with the world around you on a biological level – those instructions are complex, and there’s a multitude of information in each cell of our bodies. In order to be stored in such a small space, that information gets encoded (much like the information stored in our computers is encoded, represented by 1s and 0s). Despite being made up of only four different nucleotide bases (Adenine, Thymine, Guanine and Cytosine), the fact that individual DNA molecules can be made up of thousands to hundreds of thousands to millions of bases results in the almost incalculable number of possible arrangements of A’s and T’s and G’s and C’s. Due to its versatility, scientists are now beginning to explore using DNA as a storage medium, translating data into DNA code and recording entire books in fragments of DNA. To decode the information stored in a cell’s DNA, the cell must first transcribe the DNA into a molecule called RNA (ribonucleic acid). The RNA then gets translated into a protein, which is made up of a sequence of amino acids. There are 20 different amino acids and proteins are made up of unique combinations of these amino acid building blocks. Amino acids are coded for by sequences of three DNA or RNA nucleotide bases, known as codons. There are 64 possible codons, so some amino acids are coded for by more than one codon. You can experiment with using this kind of coding by translating your name into DNA online or with paper and pencil. You can post comments to our Google+ community in DNA code, and read others’ comments by copying them and translating them back to plain text. For further exploration, check out this Transcription and Translation Tool to translate RNA, DNA, and proteins. If you want a low-tech, paper and pencil version of the code, we also have one of those. See what the text of your found poem looks like in DNA code, or write a new poem and publish it in DNA code – the possibilities are endless! Be sure you share your DNA-coded writing in our Google+ community. For our collaborative DNA Poems/ Sculptures, you’ll work with others to write and assemble a poem that will serve as a three-dimensional model of DNA. Materials like sentence strips, dowel rods, cardboard, hot glue guns, duct tape, or any other materials you can think of will prove useful here. Trey Gass, of the Poetry Project, walks us through this step in the video below. You may also want to use our Punnett Square template. If you don’t have access to sentence strips, card stock, index cards, or chart paper can also work. Part of the fun is collaborating to make the model stand on it’s own – we can’t wait to see the solutions you engineer for your own poems! We’ll continue posting links to articles, resources and other materials throughout the make cycle, so be on the lookout for more information in our Google+ community. Want to know more about DNA coding? Join us on Friday, April 8 at 12:30 pm EST as we are hosting a Google Hangout to explore DNA coding with Dr. Christy Flint, coordinator of the Micro World Investigate Lab at the NC Museum of Natural Sciences. We would also like to invite you to join us for a Twitter Chat throughout the day on Tuesday, April 12 (9:15-9:30; 10:45-11:00; 12:30-12:45; 2:00-2:15) where we will be writing a collaborative DNA-themed poem. Read our Remix, Remake Curate About page. Reach out to us with questions or suggestions in the G+Community. We hope you delight in using what you have learned about DNA extraction and coding, and we hope you enjoy coding your own DNA poems. The posts just keep coming in! We hope to see them continue, but since it has been three weeks since we began our Bug Body Hack, we want to take a moments to celebrate the awesome creations our participants have made! We encourage you to keep making, hacking, sharing, connecting, commenting, and reflecting, and we encourage you to continue learning or thinking about something that you haven’t noticed or considered before– something about poetry, insects, making, the natural world, or learning in a diverse, open online community. Chris Goforth inspired us all with some found plant material bug hacks. Go onto the G+ Community Remix Remake Curate to see more. Check out Violet’s original composition “I Wish I Was a Butterfly” as well as some bug hacks and amazing butterfly pics here. First Graders Jack, Caleb, and Alyssa posted about their arthropods on our G+ Community. They used a tree map to help them get their stories going but were excited to take the story wherever they wanted it to take them and boy did it take them places! Kalyssa Ortiz created a centipede named Charlie and wrote a book about Charlie and his friend Tabitha. 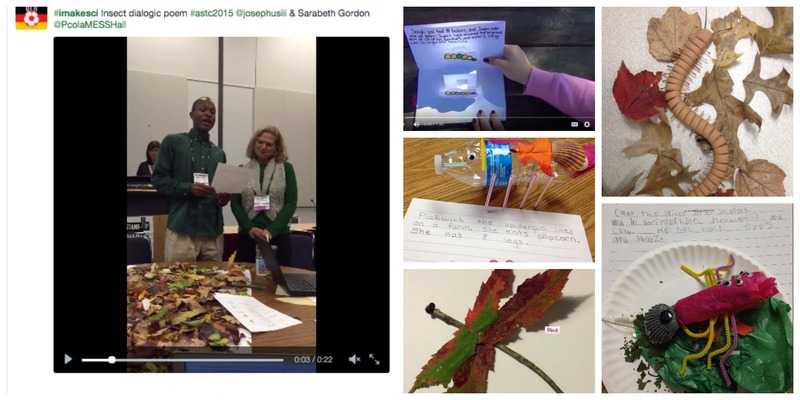 Mydiso AskewMoore created a video of her pop-up book about her hacked bug Jugnu the firefly. Our friends at the Association of Science and Technology Centers (ASTC) annual meeting in Montreal last week made bugs from leaves gathered from the sidewalks around the conference center and remixed the cycles with some dialogic poems and some awesome rhythm circles. See more in this Storify summary. We we rolling on the floor laughing at our bug personification ideas during our Twitter chat on October 15th. You can read some of our poetic contributions by checking out our Storify summary of the chat. Feel free to “steal” some of these ideas for a story of your own! Join our Google+ Community, Remix, Remake, Curate. Post your thoughts, questions, ideas, and especially your young people’s work here. Hack an arthropod body and take it to the next level with circuitry or a motor, record student poetry or stories, share their experiments, let them see what other kids are doing, and share feedback to their work. On Twitter, we encourage you to follow and use the #imakesci hashtag. Keep using #inatsci if you’re continuing to hack bug bodies or #icitsci if you’re continuing to visit your porch light and make observations and/or poetry. You are more than welcome to continue hacking or creating bug bodies, writing stories or poetry about your bugs, or even remixing Make Cycle 1 and 2 and sharing them in our G+ community at any time! Feel free to jump in on this cycle if you are new or just keep going with it. Be on the lookout for new programming coming in April 2016 during! We hope you’ll explore DNA Life-Making Code along with HTML coding and web making with us then. Finally, thanks for participating in our Bugfest make cycles! We are thrilled with the response and the content you have created throughout both cycles and the way several participants are mixing them together. We are more motivated than ever to continue to find ways to explore the intersections between science, writing, and art thanks to your creative contributions! Welcome to Week 2 of our second year of Remix, Remake, Curate! For the next two weeks, we will explore the natural world of bugs. We will focus on two major classifications of bugs that most people commonly know: insects and spiders! It can be surprising to discover how little we know about them when we live with them almost every day. You will get a chance to remix the bugs that you saw in Bugfest 1 or explore your world to find new ones to make your own Bug Body Hack. During this make cycle, we suggest the following activities to guide an investigation of two types of arthropods: insects and arachnids (spiders). Learn from the experts. Observe the insects and arachnids around you. If you can’t find any insects or if you just want to learn more, watch the video below of Dan Babbitt, manager of the Smithsonian’s Insect Zoo. Babbitt shows why the name of the zoo is a little imprecise. The Insect Zoo is home to all five major groups of arthropods—insects, arachnids, crustaceans, millipedes, and centipedes—all of which Babbitt defines. You might consider using one of the bugs you see in the video for Part 1 of this make cycle. 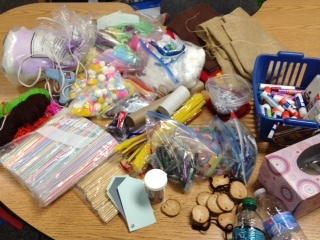 Here are some of the materials you might use to make your bugs. We will add leaves and twigs next week – to help our bugs blend in – when it is a little less soggy outside. Part 1: Bug Body Hack or Remix your bug. Create your own bug using found items from cotton ball to leaves or some of the items you see in the images below. You can remix your bug any way you like, but keep in mind what makes a bug an “insect” versus an “arachnid.” Click here for a helpful Bug Body Hack Fact Chart. All five classifications of insects are listed on the chart, but we will focus only on insects and arachnids. As always, you can create your bug however you would like. Even in the arachnid world, they have remixed themselves and although they are usually spiders, arachnids also include ticks and mites! Show us what creative bugs you have hacked by sharing a picture of your bug through a tweet or post on our Google+ community. If you would like to amp up your bug, you could add a motor from a toothbrush to make your bug move, add paper circuitry lights or solar lights, or share some more ideas by posting them on our Google+ community. Part 2: Personify your Bug. Consider the personality that emerged from your bug. Consider how your bug may be different from you and similar to you. Jha’Mai from the Poetry Project also explains this part in the video below. You might find it useful to use the Bug Body Hack Fact Chart from Part 1 to help you follow along with the information on the body parts. Click here for a template of a chart for higher levels that you might use to help you document and create a story/poem to personify your bug. For a simpler template using a thinking map, click here. Feel free to do these on chart paper or make your own if you are inspired to do so! For some ways to level up this lesson, you can take your bug on an adventure or write a story or poem from a different perspective (the tree, the chair, the predator, etc.). You can share your story through images, video, create a stop motion, or use any digital tool of your choice. For example, you could make a vine, make an interactive image using thinglink, or try out wevideo, just to name a few. Part 3: Personify your bug with poetry and Twitter. Still need some inspiration? Watch this video from Nat Geo Kids for a quick reminder of the some of the differences and similarities between bugs and humans. You will get a chance to personify your bug with poetry by joining our Twitter chat on Thursday, October 15th using the hashtag #imakesci. Be on the lookout for more information on this live interactive experience in our Google+ community. Writing materials – paper, pencil or pen, etc. Want to know more about the difference is between spiders and insects? Join us on October 7th at 8:30 am EST as we are hosting a Google Hangout to explore the diverse world of arthropods with Dr. Colin Brammer. Dr. Brammer is an entomologist and Co-Coordinator of Natural World Investigate Lab at the NC Museum of Natural Sciences. We would also like to invite you to join us for a Twitter Chat on Thursday, October 15th at 12:30 am EST where we will personify our bugs using poetry. We hope you delight in using what you have learned about arthropods to create your own unique bug, and we hope you enjoy creating a story or poem to share your creation with others. Wow! Our first make cycle is almost over! It’s been a fun two weeks and we’ve enjoyed seeing all of the great content you all have created during our cycle. We had some interesting weather that meant that the insects and other creatures coming to lights varied quite a lot during the last two weeks, but that’s part of what makes science interesting and exciting! Things change over time and it’s fun to be able to see that change first hand. Chelse Lassiter did a superb drawing of a moth. The detail on this one was impressive! David Greenwell shared an awesome poem performed with two voices that focused on one of the tiny moths that are common at lights in our area, but people rarely pay attention to. Jennifer Smyth’s students used an activity from one of last year’s make cycles and shared a video of an awesome insect-themed cipher circle (also called a rhythm circle). It sounds completely chaotic and crazy, but so fun! Abigail Jones shared a wonderful audio recording of her poem about a conversation between a ladybug and a longhorn beetle. Johnita Mitchell posted a hugely entertaining performance of her poem about a ladybug and a spider. The hand gestures and facial expressions make this one so fun to watch! Lawson Marsh shared a great drawing of a moth with the group early in the make cycle. Lots of great detail in this one! Breanna Alligood gave a live performance on our Google Hangout of her insightful poem that she wrote about the complex interactions between bugs and humans. We had a great Twitter chat on September 24th that saw a lot of people contributing to the discussion. You can review the conversation by checking out our Storify summary of the chat. Join our Google+ Community, Remix, Remake, Curate. Post your thoughts, questions, ideas, and especially your young people’s work here. Record student poetry, share their experiments, let them see what other kids are doing, and share feedback to their work. On Twitter, we encourage you to follow and use the #imakesci hashtag. Keep using #icitsci if you’re continuing to visit your porch light and make observations and/or poetry. You are more than welcome to continue visiting your porch lights, writing poetry about the things you see, and sharing them in our G+ community at any time! We’d love for anyone who got excited about this make cycle to keep going with it. However, next week we’re moving on to make cycle 2. In it, you will examine the differences between spiders and insects. If you participate in this make cycle, you’ll be able to take a lot of what you learned and observed into the next two weeks. Thanks for participating in our first make cycle! We are thrilled with the response and the content you have created throughout this cycle. It was a real pleasure interacting with you all and we hope that you learned some exciting and interesting things as you explored the intersections between science, writing, and art with us!